Falls to earths dark body. Berwick Law, East Lothian, Scotland. This entry was posted in ancient sites, elemental, mindfulness, nature photo, photos, poem, spiritual, verse and tagged earth, Haiku, mindfulness, nature, photography, poetry, scotland, spiritual, winter. Bookmark the permalink. I wouldn’t have thought of a swan wing, but now that you tell us…it really is! The light is gorgeous in this shot! Perfect description. One checks each line against the picture and does a Little Noddy Man imitation. As always thanks for thoughts. Thanks Gilly, I love the silhouette of the mound against the silky light. Lovely, Seonaid. Those streaks of molten silver….. 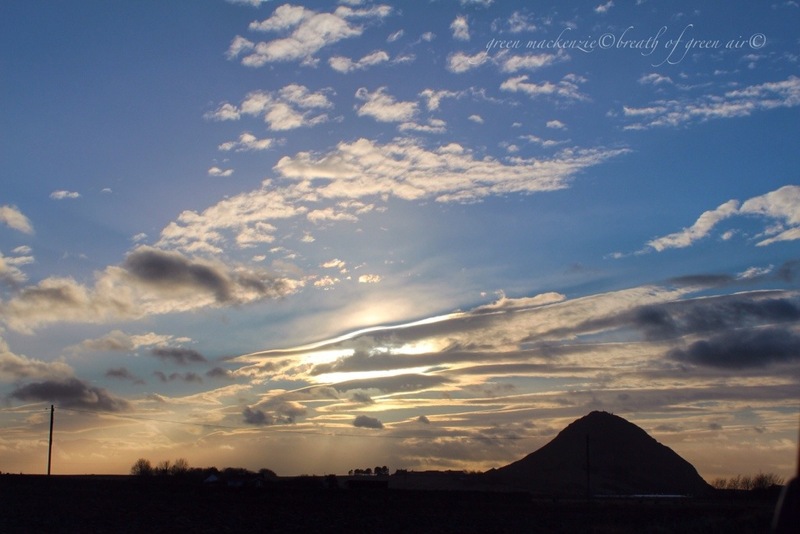 Skies hold such possibilities in thoughts Seonaid , what a wonderful serene moment you have captured . Perfect drawing down of the day Haiku for me . Beautiful colors, and very descriptive words. I like this. Thanks Pat, the sky was so mesmerising filled with this shimmering light. BTW, I hope you get to see the Northern Lights where you are tonight…. We didn’t see the lights….only on the TV programme sky watch which showed us the aurora in Norway….stunning! Silvery light is the perfect description….it’s so watery and pale at this time of year. Perhaps I could call the book mind medicine!